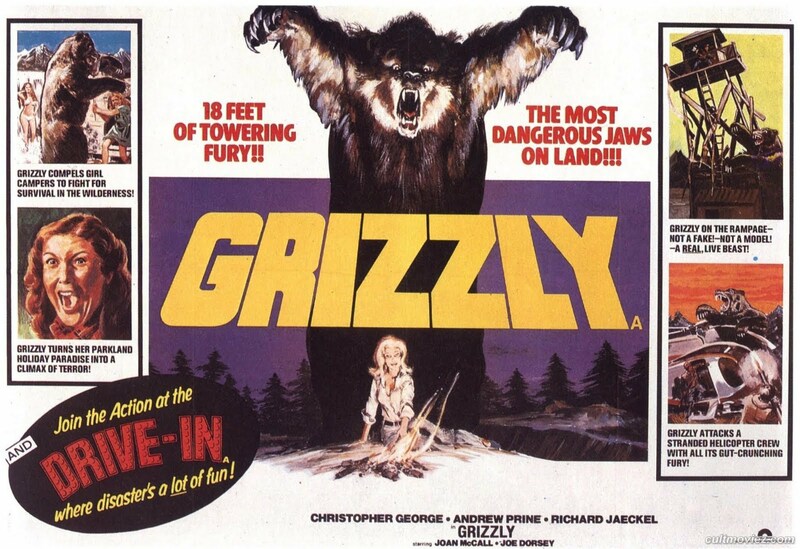 Today, I’m going to take a look at a 1976 creature feature: Grizzly. 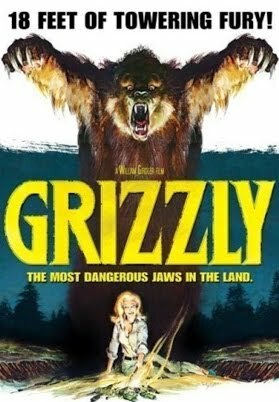 Grizzly was directed by William Girdler, who tragically died in a helicopter accident at the young age of 30. However, he made nine films in his six years as an active director, including Grizzly, Day of the Animals, and Asylum of Satan. The central cast of Grizzly was made up of Christopher George (The Rat Patrol, The Exterminator, City of the Living Dead, Pieces, Day of the Animals), Andrew Prine (Gettysburg, The Miracle Worker), and Richard Jaeckel (The Dirty Dozen, Starman, 3:10 to Yuma, The Green Slime, Walking Tall Part 2). The cinematographer for the film was William L. Asman, who is an experienced camera operator who has worked on shows like Star Trek: Deep Space Nine, 7th Heaven, and Melrose Place, as well as on movies like The Octagon, Brainstorm, Loverboy, Gremlins 2, Matinee, Speed, and The Rocketeer. The editor for Grizzly was Bub Asman (cinematographer William Asman’s brother), who also cut Day of the Animals, and is a veteran sound effects editor with credits such as Sicario, American Sniper, Million Dollar Baby, 1941, Red Dawn, First Blood, Conan: The Barbarian, Speed 2, Demolition Man, and Prisoners. The music for the movie was composed by Robert O. Ragland, whose other credits include 10 to Midnight, Q: The Winged Serpent, The Fear, The Touch of Satan, and The Thing With Two Heads. The special effects work for Grizzly was provided by the duo of Phil Cory (Misery, The Aviator, Stop! Or My Mom Will Shoot, Cobra, Mannequin, The Wraith, The Monster Quad, Weekend at Bernie’s) and Bob Dawson (Star Trek III: The Search for Spock, Star Trek II: The Wrath of Khan, Christine, Prophecy, The Day After). the tale [of the movie’s failed creation] involves — among other mishaps — stolen money, malfunctioning special effects and a script that was rewritten by none other than its Hungarian caterer. In addition to the uncompleted sequel, there is also a fake sequel that is occasionally marketed as Grizzly II. 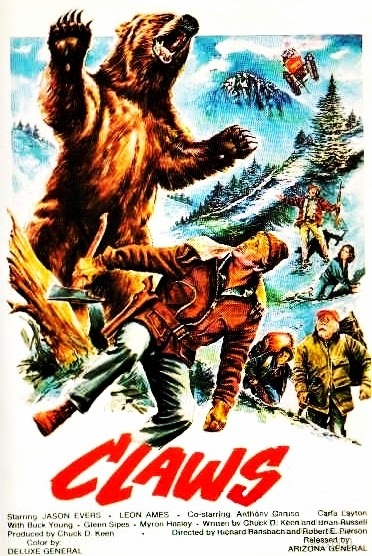 1977’s Claws, which is also about a killer grizzly bear, was re-released in the United States in 1978 in an attempt to capitalize on the success of Grizzly. Grizzly was one in a large wave of Jaws knockoffs featuring any number of predatory animals that spanned throughout the late 1970s and early 1980s. Others films in this sub-genre included Piranha, Alligator, The Last Shark, Tentacles, and Orca. The live bear used in filming was named “Teddy”: he was an 11 foot tall grizzly bear who was, at the time, the largest bear in captivity. The cast and crew were kept separated from the bear by an electric barrier for their safety, as the bear was trained by not tamed. For the attack sequences, a robotic bear was used in his place. Grizzly was made on a low production budget of $750,000, on which it took in $39 million at the box office. This made it the most financially successful independent film of 1976, and for a time, the most profitable independent film of all time (a title that would be taken by Halloween two years later). Despite the financial success of the movie, it isn’t a film remembered very fondly. Currently, it holds a 29% audience score on Rotten Tomatoes, alongside a 5.3/10 user rating on IMDb. The first thing that is impossible not to notice about Grizzly is its similarity to Jaws. This movie is utterly unashamed about how much of a blatant knock-off it is. Instead of a shark, there’s a bear. Instead of a boat, there’s a helicopter. There are still three dudes making up the central team that faces off with the monster: a frustrated enforcement official, a salt of the earth quasi-sage, and a scientific naturalist. There are the same tensions with authority, as the Amity Island mayor is replaced by the head of the national park. Even the debate over species is the same: the authorities won’t acknowledge the presence of a grizzly bear in the same way that authorities didn’t acknowledge the unlikely presence of a great white. Swimmers are exchanged for hikers, rabid shark fisherman for game hunters, etc, etc, etc. One of the few points of departure is that the mauled kid gets to live, but the audience is shown some severed child-limbs for good measure. That said, the Jaws formula, when done well, works. Grizzly is by no means Jaws quality, but the interactions between the three central characters are pretty interesting, and they seem pretty tangible and believable. The gore effects are kind of fantastic, and, shockingly, the attack sequences themselves are pretty decent. Unlike with Jaws, there is actually a fair bit of exposure of the big bad bear here, though the supposed scale isn’t well conveyed (a judicious use of miniatures would have won serious bonus points from me). I was actually surprised that this movie didn’t rely on stock footage for the bear, as most cheap knock-offs tend to do for wildlife. The actual attack scenes of course feature disembodied bear claws and fake bear replacements, which are also used to pretty good effect in their own right. For such a cheap movie, there are some seriously entertaining set pieces in Grizzly. The first one of note is when the bear takes down a forestry service guard tower, which is pretty fantastic and harrowing to watch, despite how obviously cheap it was. On top of that, there is a pretty cool finale sequence where the bear takes out a helicopter, which is exactly the kind of thing anyone would want from a giant bear movie. Overall, I was surprised how much fun Grizzly was. It is definitely not a strong recommend, mostly due to the pacing getting pretty slow and the action getting repetitive after a while, but it is still one of the better cheap Jaws knockoffs I’ve found. For movie buffs, it might be fun to devise some sort of Jaws bingo to play along with Grizzly. Bad movie fans, and folks who relish the bygone era of late 1970s creature features will find plenty to like here. I’m always up for a cheap Jaws knockoff. Nice piece!